Dec. 13, 2012, 10 a.m.
As the pro-sharing license celebrates its 10th birthday, the nonprofit outlet says encouraging republication has meant more than 4 million extra pageviews on its stories so far this year. By Richard Tofel and Scott Klein Dec. 13, 2012, 10 a.m.
Editor’s note: On December 16, 2002, the first Creative Commons license was issued. The idea behind CC — giving content creators an easy way to let others copy, modify, or build on their work — has made a major impact on a number of fields, from music to photography to journalism. One of the most prominent journalistic producers of CC’d content is the nonprofit ProPublica, which releases nearly all of its work under a Creative Commons license. With CC’s 10th birthday upon us this month, we asked Richard Tofel and Scott Klein — ProPublica’s general manager and editor of news applications, respectively — to tell us what allowing their work to be shared so broadly has meant for the organization. ProPublica has made important use of Creative Commons since our launch four and a half years ago. While we make a few exceptions at the request of publishing partners, our preference (and our general practice) is to make all of our stories available for republication under a Creative Commons license (in our case, the “Attribution-NonCommercial-NoDerivs” version), with some extra requirements specific to our needs. The terms are described on a page headed “Steal Our Stories,” which is, in turn, linked to from every page on our site. Moreover, every story has a “republish” button, which makes republishing our stories and complying with the license easy: Pushing that button reveals a box containing an easy to copy-and-paste version of the story using only common html tags, without multimedia or other elements that often make republishing difficult in content management systems. The code also contains our special tracking tag (more on that later). In the last year, republication of ProPublica stories under our CC license has increased dramatically. Through November, we’ve recorded more than 4.2 million pageviews this year for authorized reprints of our work, which is up 77 percent over the same period in 2011, and is the equivalent of an additional 29 percent on top of the traffic to our own web site. 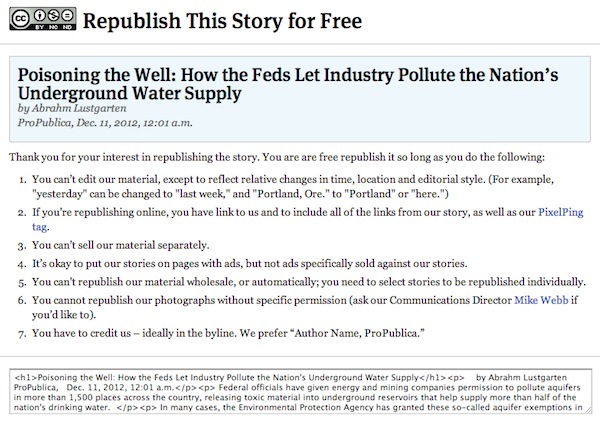 Among the literally thousands of sites that have reprinted ProPublica stories in 2012 alone are Ars Technica, the Atlantic Wire, CBS News, the Charlotte Observer, the Chronicle of Higher Education, the Cleveland Plain Dealer, Foreign Policy, the Houston Chronicle, the Huffington Post, the Las Vegas Sun, the Los Angeles Times, the Miami Herald, MinnPost, Minnesota Public Radio, Mother Jones, MSNBC, Nature, NBCNews.com, the Newark Star-Ledger, the New Haven Register, the New York Daily News, the San Jose Mercury News, Scientific American, the Seattle Times, Slate, Talking Points Memo, the Tampa Bay Times, the Trentonian, USA Today, the Utne Reader, Wired, and Yahoo News. Why do we do this? ProPublica’s mission is for our journalism to have impact — that is, for it to spur reform. Greater reach — the widest possible audience — doesn’t equate to impact, but it can help, and certainly doesn’t hurt. So we encourage it. And, of course, we started in 2008 with almost no audience or reputation at all, and needed — and still need — to increase the circle of people who know us, and our work. CC helps us achieve that goal. There are a few catches, though. Our stories are (we hope) carefully crafted, and often a bit tricky — controversial, frequently somewhat damning. So we insist that they be reprinted in full, essentially without editing. The “NoDerivs” part of the CC license makes that requirement very straightforward. And we are interested in readers coming back to our website to read related stories and see related multimedia, so NoDerivs helps us require that internal links in a story be maintained. In addition, while we’re a nonprofit, we see no reason why others should be able to sell our work without sharing the proceeds with us, so we prohibit commercial use of our stories via the “NonCommercial” license. We define “noncommercial” to mean that the stories themselves may not be sold, nor may advertising be sold specifically against them. We try not to be commercially naïve, and we’re hardly anti-capitalist, so we’re fine with ads appearing on pages along with reprints of our stories, and we are happy to have our stories appear behind paywalls or count against pay-meter thresholds. These extra requirements, set out on our Steal Our Stories page, effectively constitute our own glosses on the CC license we employ. Creative Commons solves a particular problem for us — how to encourage republication at scale without tying up staff in negotiating deals and policing unauthorized uses. We’ve found it an invaluable aid in building our publishing platform, in reaching additional readers, and in maximizing the chance that the journalism we publish will have important impact. POSTED Dec. 13, 2012, 10 a.m.
Tofel and Scott Klein, Richard. "ProPublica: Why we use Creative Commons licenses on our stories." Nieman Journalism Lab. Nieman Foundation for Journalism at Harvard, 13 Dec. 2012. Web. 18 Apr. 2019. Tofel and Scott Klein, Richard. "ProPublica: Why we use Creative Commons licenses on our stories." Nieman Journalism Lab. Last modified December 13, 2012. Accessed April 18, 2019. https://www.niemanlab.org/2012/12/propublica-why-we-use-creative-commons-licenses-on-our-stories/.